Wine country, gastronomic center and home to opera festivals, glorious art and ancient Roman ruins, Verona is a Northern Italian city with plenty to offer every kind of visitor. Yes, it was the setting for the Shakespearean tragedy Romeo and Juliet, because the city certainly doesn’t lack romantic charm. Sorting through the abundance of great restaurants, bars and museums can be a bit overwhelming, so we’ve compiled a list of the twenty best attractions that Verona has to offer. 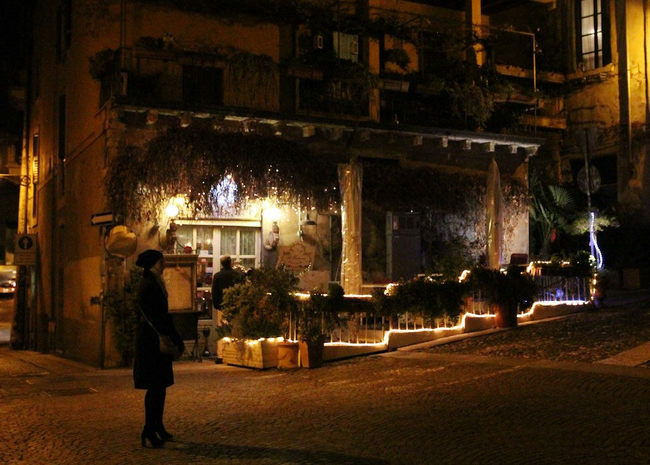 Though it might be called “the osteria of the liar,” this place is the genuine article. The owner of the restaurant, has a vineyard in Valpolicella, where the house wines are made. You can taste the true passion for Veronese gastronomic traditions in the cheeses and salumi, the primi of freshly made pasta, and the stick-to-the-ribs secondi of meat and polenta. 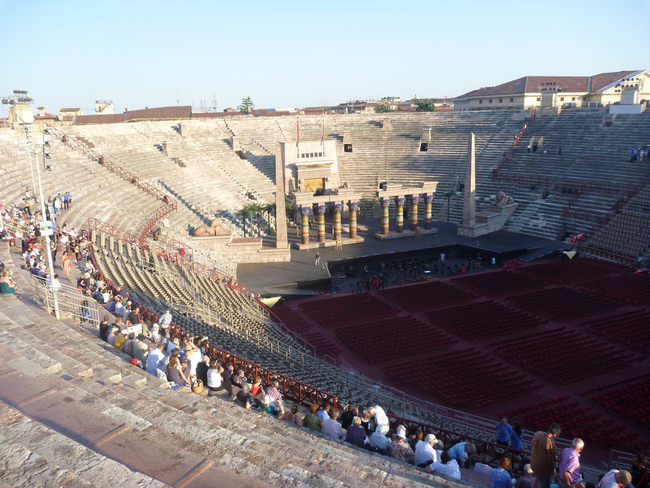 The Arena is a functional open-air amphitheater that goes back two thousand years to ancient Roman times. Now, it still plays host to all kinds of concerts and performances, including an excellent summer opera festival. It’s a great place to spend a summer evening. This gorgeous Romanesque basilica was built in the 12th century, but its core dates back to as much as 1,500 years ago. It’s a truly magical place with the stained glass rose window, elaborately crafted bronze doors, colorful early Renaissance frescoes and a breathtaking main triptych by Andrea Mantegna. There’s a lot of life in the piazza in front of the church with families coming and going, children playing and friends meeting up for a chat. Sundays will bring the lovely antiques market full of old furniture, books, jewelry and other delightful knick knacks. Old-fashioned and cozy, Monte Baldo is packed to bursting at lunchtime and in the evenings with a diverse crowd of locals, students and visitors alike. They have a well-chosen, affordable wine list and great nibbles to go with your glass, like crunchy balls of fried eggplant and thin slices of mortadella on bread. Italian art nerds will find plenty to marvel over at this museum in Verona’s historic center, where the collection has been curated for the former Palazzo della Ragione. Their extensive permanent collection goes through about two centuries of Italian art, from the 19th century Academicism to the furious energy of the 20th century Futurists. This little pastry shop is just the place for a classic Italian breakfast of a shot of coffee and a sweet, buttery baked treat. This bakery is the genuine article, its display stuffed lovingly with cream puffs and gleaming fruit tarts. It’s full of locals in the morning, who eat lined up at the counter elbow-to-elbow. A real institution for wine lovers, this place has its roots in the 17th century and it’s currently owned by the Amarone family. Winner of many awards from Wine Spectator, it’s one of the best places in the city to taste wine from all over the world. Entering through the all-white storefront, you’ll find yourself in an elegant living room full of gorgeous things. Cecile is a boutique run by three women passionate about vintage. You’ll find everything from the 40s right on through to the 80s, as well as more recent collections. This incredible Romanesque church dates back to 1187. The gorgeously vaulted interior is made with pink Verona marble and you’ll find incredible medieval frescoes as well as paintings by Renaissance greats such as Titian. Surrounded by lovely medieval and Renaissance architecture, this is the heart of the city where vendors sell kitschy souvenirs by day and young people come to drink and party at night. Have a drink in one of the nearby cafes and watch the city go by. This is one of the oldest osterie in all Verona and it’s got a wonderful, old-fashioned feel with wooden fixtures and communal tables. The owner-proprietor Signora Annalisa keeps a wine list of over 40 regional wines that you can order by the glass, and a menu full of hearty Veronese favorites like baccala alla vicentina and polenta with Asiago and mushrooms. This imposing fortress with lovely views of the river Adige once belonged to the della Scala family, but now plays host to the civic art collection, with delightful historical artifacts and works by artists like Rubens, Mantegna and Tintoretto. This gorgeous 16th century garden behind a 15th century palace is an incredible piece of verdant paradise. Explore the weather-worn statues, greenhouses full of lemon trees, artificial caves and a 18th-century labyrinth of bushes. This ultra-romantic, high-kitsch hotspot might or might not be the historic house of Shakespeare’s timeless heroine. One thing’s for sure though, it’s a huge draw, with crowds of people coming in every day to feel a bit closer to that lyrical story of all-consuming young love. This Michelin-starred osteria features good, traditional Veronese cooking, with just a slight modern twist. An interior full of beautiful old things is complemented by outdoor seating when there’s warm weather. Try the braised beef in an Amarone sauce, or the agnolotti pasta with Grana Padano and black truffles. This Renaissance-style church contains the only work of the master painter Paolo Veronese that’s on view in the city. The Martyrdom of St George that’s on view here is worth the trip, showing a divine scene as an exquisitely painted, colorful earthly carnival. Malacarne is a bar and social center decked out in quirky bits and bobs taken from flea markets and vintage shops. Come for a taste of Italian craft beer and to hear great live music from local artists. A magical place for readers, Il Gelso is crowded with good books, handmade stationery and other curios, making for a really warm and welcoming atmosphere. You can spend hours browsing here amid the well-curated displays, but it certainly won’t be long before this becomes one of your favorite places in the city. This ice cream shop is a part of Veronese history, as it was first founded in 1939. You can get a simple cone, an ice cream sandwich, or a stick of vanilla gelato covered in chocolate. Best of all, they’re open until midnight, so you know where to satisfy that late-night craving.